You can get it in Midtown. You can get it in East Memphis. You can get it in the ‘burbs. And now, you can get a self-serve frozen yogurt fix downtown. 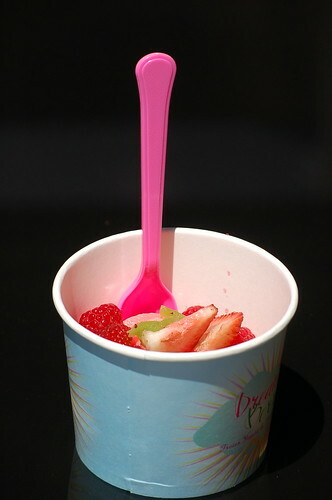 Dream Berry opened a few weeks ago on the Main Street mall. It’s the latest in the very long line of self-serve frozen yogurt shops that have opened in Memphis in the last year. When I stopped by this afternoon, the spacious storefront was nearly empty. I grabbed a cup, filled it up about halfway with bright pink watermelon sorbet and topped it with fresh strawberries, kiwi slices and raspberries. Dream Berry offers 10 flavors of yogurt every day. Today’s options were pretty basic, but my watermelon sorbet was delicious. It was a perfect mix of sweet and tart, and the texture was great. At the end of the line, candy dispensers hung on the wall and a bins were filled with fresh fruit and cookie dough bites. All of the basics were there, but the selection seemed a little underwhelming (especially if you’re used to the veritable buffet of choices at YoLo). The yogurt costs 49 cents per ounce, which is comparable to other shops in town. I liked Dream Berry’s space, though. It’s large, and windows line the Main St. side of the building, making for optimal people watching. The furniture is sleek and modern, and there’s a giant mural of the Memphis skyline on one wall. Outside, there are some partially-shaded wicker chairs and tables. Dream Berry is open daily from 11 a.m. until 10 p.m. (and 11 p.m. on Friday and Saturday nights). They accept all major credit cards. Firefighters, police, students and employees of AutoZone, take note – if you flash your ID, you’ll get 10 percent off.